A decent pair of designer jeans are the ultimate wardrobe staple. Now with so many different variations in fits and styles on the market, it can sometimes become overwhelming choosing the right pair. 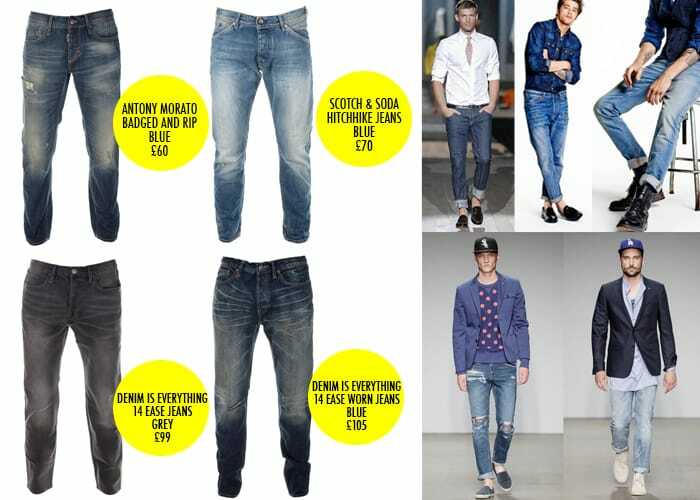 If you’re looking to invest this season, read up on our guide to designer denim at Intro. Whether you like them or not, slim or ‘skinny’ jeans have dominated the menswear denim market for quite some time now, and it looks like they’re staying put. With all stereotypes and feminine associations now banished from skinny jeans, there really is no shame in embracing this modern fit of jean. If you’re new to this particular style, begin by looking for a more tailored fit rather than something overly skin tight. This will guarantee both comfort and a flattering silhouette. One of the great things about a slim fitting pair of jeans is their versatility. As well as looking stylish with t-shirts and trainers, they also create a much tidier and sleek finish for a night out, when worn with shirts and a formal shoe. A relaxed fit has been a key player in the forecast for SS14 and AW14 trends. The overall fit is still slim, however slightly less tapered at the ankles with a straighter finish. This style of jean gives off a sportier, casual feel to an outfit and works great with basic tees and vests. If you have something special planned, then you can transform your look into something more sophisticated with the addition of loafers and a slight roll to the hems. layer up with an unbuttoned designer men’s shirt for effortless summer style. Summer is the ideal time to experiment with lighter washes on jeans. However if you’re looking for a more subtle alternative to a fully bleached pair of jeans, look out for soft distressed markings. These also also help to add a much more authentic feel to the wash. Dark men’s jeans are suitable pretty much all year round. You can’t go wrong with a classic dark denim or black jeans and they look great with just about anything.